After Bayern recorded their 2nd loss of the season to the hands of Mainz, their clash against Borussia Dortmund had some added interest as a Dortmund win would see the Bavarian lead cut to just 2 points. Tuchel took inspiration from his former club’s win and opted for a 5-chain in defence which a number of similarities between the two systems. Tuchel opted for quite a drastic change to his side’s structure and the selection had some reflection in that too. He brought in Erik Durm to play in midfield and although most would’ve expected to see him on the wide left, he instead occupied the right wing-back slot on the side of the back three. Piszczek moved to a permanent centre-back position too instead of his previous right-back role which would see him shift towards the RCB of a three-chain instead. Whilst Tuchel made such changes, Guardiola’s selection was fairly standard. Young star Joshua Kimmich was chosen ahead of Benatia and went on to be one of the best performers whilst Vidal and Alonso were chosen for the two central midfield positions. Lahm came back into the starting eleven after his midweek absence. Müller also started after coming off of the bench against Mainz and played high up in the right 8 position. Tuchel’s interesting decision to move towards a 5-chain proved to be an excellent one as the defensive line and its mechanisms were ultimately crucial in the defensive stability of the home side. The most notable feature of the defensive line was the movements into the 6 space made by mainly Hummels but also by Piszczek down the right side on a less common basis. Both centre-backs had the capacity to leave the defensive line and move up into a defensive midfield position out of possession whilst Weigl and Gündogan’s defensive efforts were made higher up the pitch. Through moving out of the defensive line, Hummels can cover Müller’s movements and occupy the space behind the central midfielders. In doing this, Dortmund achieved two things. Firstly, it allowed them to follow the dropping movements of the Bayern forwards and most specifically Thomas Müller whose movement is amongst the best in the world. Through following these movements, Hummels and co. restricted Bayern’s ability to create free men between the lines as even when Weigl and Gündogan had been drawn high up with their man-orientations, the Bayern players in the space behind could not be accessed cleanly. In addition to this, the forward movements from the defensive line supported Dortmund’s diagonal compactness. With the two Dortmund central midfielders relatively high, there was potential for large spaces to be found between the midfield and defensive lines. However they were able to cover these spaces effectively through the orientation of Hummels and Piszczek who could move up and occupy the gaps well to stop Bayern from taking advantage of them. Through the coverage of the 6 space, both Weigl and Gündogan benefited from having greater freedom in their pressing higher up the pitch. The two midfielders often took higher positions than Reus and Mkhitaryan due to their man-orientations on Alonso and Vidal yet they didn’t have to worry about the space they left behind due to the cover of the centre-backs. With an increased ability to press higher, Weigl and Gündogan were able to move higher in their man-oriented press and provide strong coverage on Alonso and Vidal when deep in Bayern build-up. Along with the pressure of the front three, Dortmund were able to develop relatively strong defensive access against Bayern and prevented them from cleanly progressing the ball through the centre. Furthermore the numerical superiority in the first line supported their defence of wide areas. Through the 5-chain Dortmund’s defensive line were able to shift across effectively and restrict any space on the wings for Bayern to utilise. The ball-near centre-back could move out and apply pressure in the half-space as they looked to prevent Bayern from breaking through in isolations with either Costa or Robben in these areas. The mechanisms were not always clean however as Dortmund faced some issues with the moving out of Hummels when Müller dropped deeper than the Dortmund 6 space. Hummels was reluctant to follow his German national teammate and instead would retreat with the intention of having a midfielder pick him up. However this was not always co-ordinated well and in these scenes Müller was able to progress the ball in build-up through proving a connection into the midfield whilst the man-oriented press of Dortmund were focused on other areas. In addition, the coverage of the defensive line in reaction to Hummels’ movements could also have been better. In some cases they didn’t cover the space Hummels left in the defensive line efficiently enough and this resulted in short moments of instability for the home defence. These issues could possibly have arisen from the man-orientation of the defensive line. As Bender was occupying the central Lewandowski and Schmelzer was more focused on stopping Robben it became more difficult for them to co-operate together to close the spaces left by Hummels’ movement. Dortmund’s 5-4-1 deeper within their own half. Deeper within their own half, Dortmund acted more clearly in a 5-4-1 shape. The two wing-backs moved back into the defensive line whilst Reus and Mkhitaryan dropped into either side of the midfield. Levels of horizontal compactness were relatively strong as the two wide players supported the midfield inside however there were some issues still with diagonal compactness. To combat this we saw the same movements from Hummels and Piszczek as they filled the 6 space relatively well. Tuchel’s side started brightly and were able to have a strong share of possession against a Bayern side renowned for their dominance of the ball. They showed great balance within what appeared to be a 3-4-3 structure with safe circulation of the ball which lead to a couple of fast openings behind the Bavarian midfield. The two wing-backs moved high up into the midfield whilst the three centre-backs stretched out from half-space to half-space. Mkhitaryan and Reus played just deeper and to either side of Aubameyang and a 3-4-3 structure was formed. In many games since the Winter break, Dortmund have utilised a three-chain in the build-up of possession through an asymmetrical defensive line where Schmelzer moves much higher on the left whilst Piszczek drops as a situational right-sided centre-back. This has had a number of effects on the building game of Dortmund. They benefit from greater stability in the development of possession as the 3-chain provides better protection against turnovers whilst the wider ball circulation gives some safety too. However there are some consequences as the greater stability-focus results in a less threatening build-up and Dortmund have found greater difficulty in breaking through the lines of opposition pressure in recent weeks. The three-chain also provides Hummels with greater freedom to exercise his playmaking abilities. One of Dortmund’s most dominant players on the night, Hummels’ distribution and playmaking was particularly excellent as he consistently hit difficult long balls forward with an impressive level of accuracy. The presence of both Bender and Piszczek as well as the dropping of Julian Weigl gave him better support to drive forward in the left half-space without consequence and he did so very well. One of the more threatening aspects of their game was the large number of long balls played through the centre of the pitch during. Using the strong playmaking abilities of Hummels, Dortmund frequently looked to play long balls towards the front three who were positioned within short distances of each other to then break away from the resulting knock-down. Although ultimately Alaba and Kimmich dealt with the threat over the course of the game, there seemed potential in these long passes to create chances in transition particularly. Making a surprise appearance in the starting eleven, Durm’s role on the right was quite important for Dortmund’s possession game. When Dortmund have recently used a 3-chain in possession, it has been Mkhitaryan tasked with providing the width down the right. However when confined to a wing, the Armenian cannot use his excellent team-tactical abilities to his fullest as he has restricted space and movement due to the presence of the touchline. Mkhitaryan was oriented more inside as Durm provided the width. With Durm now providing the width down the right, Mkhitaryan could play inside and around the half-space instead where he was able to have a much greater influence. Now with much more space and in a more central role, he could cooperate with teammates to a much higher level and use his high intelligence to create connections, combine with teammates and create strong micro-structures within the Dortmund shape. Similarly to their Dortmund opponents, Bayern were also man-oriented in their pressing and defended well within Dortmund’s own third. Costa and Robben support Lewandowski in pressing the Dortmund back three whilst Müller also pressed high in a central position. Their man-orientations resulted in generally good defensive access as the Bavarian side were consistently in a position to apply pressure with good coverage of nearby passing options. In their pressing, it seemed that Bayern had somewhat of a strategy to force Dortmund to build possession through Piszczek and Durm on their right, where Guardiola’s side could trap them and force turnovers. In recent games for Dortmund, Piszczek has shown an inability to progress the ball effectively as a part of a defensive line whilst Durm’s ability to support possession is the lowest out of the eleven which Tuchel selection. After inviting Dortmund to move the ball down the right side of their 3-chain to Piszczek, Douglas Costa would move up and press diagonally to show him towards the touchline. In co-ordination with this, Bernat would position himself just short of Durm and thus the German full-back would seemingly be ‘open’ for a pass down the wing. Immediately following the pass, Bernat would push up rapidly whilst Douglas Costa would continue his run and now cut off the return pass back to Piszczek. Bayern would then use man-orientations in the centre through Vidal and Lewandowski to then cut off any passing options into the centre and Durm would be isolated against the touchline. Then they press intensely, Costa cuts off the pass back and Bernat pushes up. Durm is isolated against the touchline and is defended easily. This highlights the strength of the touchline in defence as Durm then has no clear options with only 180′ degrees of movement possible due to the immediate presence of the sideline. Bayern can exploit this lack of space by pressing with greater intensity and closing down any options inside which leaves Durm with no means of safely moving the ball away from this pressure. During Bayern’s possession, Kimmich shone alongside David Alaba and showed his potential as his intelligent circulation and positional sense was crucial to the Bavarian build-up. The young defender was frequently positioned strongly to support his teammates whether it be moving the ball to open a passing lane or being able to relieve pressure off of his midfielders. Alonso was positioned slightly ahead of him whilst both full-backs were positioned higher up on the flanks. Whilst Alonso was deep, Vidal was often much higher off of the ball and would usually be positioned behind the Dortmund midfield on a more similar line to Müller than the Spaniard. Robben acted on the right and made his usual inside movements whilst Douglas Costa was much more wing-oriented on the left of the shape. The orientation of the full-backs was particularly interesting. In recent weeks we have seen Bayern’s full-backs both moving inside where they support the possession from the half-spaces, Lahm has acted deeper and aided the circulation of the ball in midfield through the right whereas Bernat has played higher and acted commonly between the lines of midfield and defence. Throughout the game, Bayern showed their own problems with possession of the ball. Against an albeit strong defence, they were unable to consistently develop access into the central areas of the pitch and couldn’t break through Dortmund’s midfield quick enough. Quite often they lacked sufficient occupation in the centre and their lack of presence made it difficult for them to move the ball through there. Alonso’s positioning was as ever often too close to the ball in build-up whilst Vidal’s forward runs would create a disconnection between the two and further inhibit Bayern’s ability to pass through the centre. Even though Müller supported to some extent in the right half-space, the poor co-ordination between Alonso and Vidal was a crucial issue with Bayern’s spacing and their weak structuring through the centre became problematic. 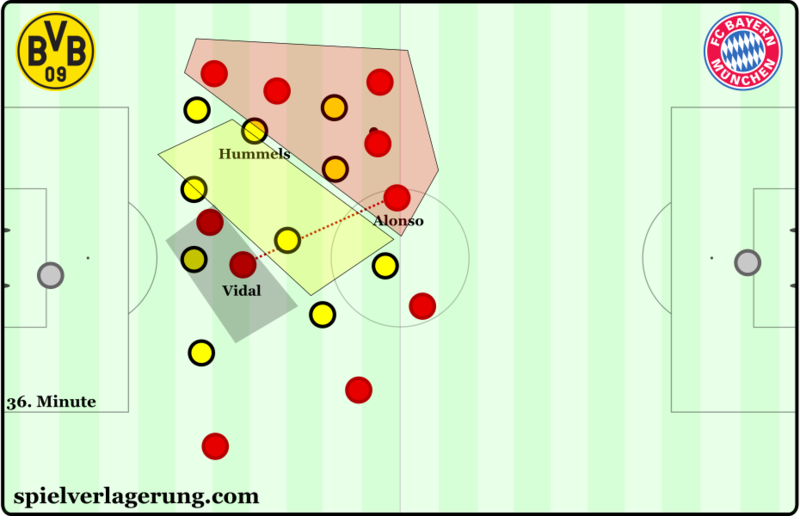 Dortmund worked well to emphasis this disconnect through their effective pressing whilst the outward movements from the defensive line elaborated this with good coverage of both Vidal and Müller. There was often a disconnection between Vidal and Alonso which made ball circulation difficult. Being unable to consistently break through the centre, Bayern turned to more of a right-sided focus in possession with quite a number of their attacks forward going through the right of the pitch. Lahm supported well through his wider-than-usual positioning, facilitating the progression of the ball effectively as he received a number of passes on the touchline. His return was much needed for Bayern as in their loss to Mainz, Rafinha attempted to fill his void but ultimately failed to do so. From the right half-space, Müller was important in opening gaps behind Dortmund’s midfield through his frequent movement dropping or to the right. The man who benefited from this the most was Arjen Robben, who could then move into this newly-created space and the Dutch winger rotated with Müller on a number of attacks through the right. Following the break we didn’t see the battle of tactical adjustments which a clash between Tuchel and Guardiola would suggest. Dortmund’s approach showed little change even despite Dortmund’s requirement of all three points to stay in the race for the title. Meanwhile, Bayern were happy to settle for a draw which would see them 5 points clear and become more stability-focused as the second half progressed. A slight change we did see was a deeper-oriented Vidal in possession as the teams emerged after the half-time break. As I mentioned previously, Vidal acted very higher in possession during the first half and was often disconnected from Alonso which had a negative impact on Bayern’s midfield possession. By having the Chilean midfielder play deeper, Guardiola will likely have been looking to resolve this issue through a better-connected midfield with Vidal supporting the progression of the ball from the 6 space. The deeper movements of Vidal also threatened to open up spaces higher behind the Dortmund midfield and we saw Müller situationally move towards the left half-space, though this mechanism amounted to little. However this was not wholly effective. Vidal did move deeper and played more closely to Alonso however the poor level of co-ordination between the two was evident and meant that there were still significant deficiencies in Bayern’s possession game. Despite being closer and technically being connected more consistently, these connections were not always strong with both players displaying a weak positional sense. In many scenes they occupied the same spaces as each other whilst their movements were often inappropriate. With that being said, this didn’t cause much concern for Bayern. Guardiola was happy for the game to finish as a draw and through their strong coverage of the Weigl-Gündogan pairing could confine their opposition quite comfortably. You could argue that Tuchel took too long to adapt his team, as Ramos’ introduction was the first substitution made in the 81st minute. It was quite unfortunate that we weren’t treated to the constantly-changing match-up which we saw in the Hinrunde, yet Guardiola will have been more than happy with how the game developed as the rhythm of the match was massively in favour of the Bavarian side. They were content to play in a pre-determined strategy with an increased emphasis on stability through the latter stages of the game and pick up a draw which all but decides the fate of this year’s Bundesliga. Would you say that there is a trade off between how “safe” a build-up structure is and how threatening it is for the opposition? I don’t think so. Depends on the quality of the players, but build-up processes focused on creating a man extra in the 1st line or in midfield are increadibly safe for you and threatening for the opposition. What struck me most was the similarity in approaches, and like you mention in the conclusion, how little tactical variation we saw in Tuchel and Pep’s plans. The man-oriented press was quite similar, build-up play with 3 at the back, and of course the positional play itself (JdP). I know that Tuchel’s Juego de posicion is something he took from and based off of Pep’s, whereas Pep took lots of ideas from his own mentors like Lillo, Volpe, etc. Could you expand on this or point me in the direction of the similarities (and differences) of the two’s interpretations of Juego de Posicion? As someone who focuses on Bundesliga and BVB, could you suggest an article or two that goes into detail on Tuchel’s JdP (especially as it relates to influences, Pep’s ideas and philosophy)? I think I remember reading something of Rene’s on Perarnau magazine a while back, maybe? Anyways, we’re fortunate to have an english version of the site so as to benefit from these sorts of articles and analysis!